Today (Tuesday): Humid, gusty, showers/downpour. Highs around 70. Overnight Tuesday Night: Locally damaging wind gusts, showers to rain & thunder. Lows in the 60s. Wednesday: Downpours, thunder. Windy Cape Cod. Highs in the 60s. The NBC Boston and necn Early Warning Weather Team continues an Early Warning Weather Alert for our area into Wednesday. 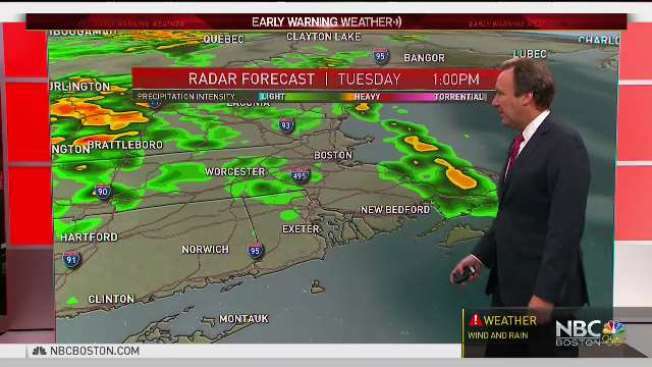 Periodic showers and downpours will continue, off and on, throughout the day Tuesday, ramping up to torrential downpours with thunderstorms in far Western New England by Tuesday night. Flash flood watches and wind advisories are already in effect for some parts of New England. For western Connecticut and western Massachusetts, embedded severe thunderstorms focusing strong wind gusts are possible Tuesday night. Farther east, the heaviest rain holds off, but wind will increase considerably from the southeast, gusting to 45 mph during the afternoon to early evening and bringing down widely scattered tree limbs for a few power outages. As of Tuesday afternoon, winds had already knocked down trees or tree limbs in Attleboro, Belchertown, Brookline, Fairhaven, Hanson, Holliston, Hudson, Medfield, Milton, Sherborn and Weston, Massachusetts. By Wednesday, the round of heavy rain moving east out of Western New England sets up in the east and delivers torrential downpours at times that will both slow the morning commute and linger through the day, raising the risk of localized flooding in eastern Massachusetts cities and towns where downpours persist. The Massachusetts Emergency Management Agency is also warning of dangerous cloud-to-ground lightning and possibly even an isolated brief tornado. Though the most significant rain shifts east Wednesday evening and night, enough moisture and upper level energy will linger for renewed scattered showers Thursday with cooler air moving in before a fair, pleasant and dry Friday and Saturday provide a chance for raking. Another sizeable storm is in the offing Sunday into Monday, with more rain, more wind and this time perhaps enough cold air behind it to produce a few snowflakes in the Green Mountains by Monday night into Tuesday morning! If that does happen, the flakes would be wet and short-lived, with the air sure to moderate after Tuesday morning in the exclusive Early Warning Weather 10-day forecast.